Since the mid 1900's, humans have contemplated conducting a human mission to the Red Planet. Before such a mission can be done, we must answer specific questions pertaining to the survival of those that embark on this adventure. For most recent robotic missions to Mars, the goal has been to seek signs of past water. Those signs have been found and the emerging new goal is to seek rock records of where past environments were "habitable" - where life could survive and multiply. Water is vital for life, but other conditions need to be met too. The water cannot be too acidic or too saline. The key chemical elements for life - carbon, nitrogen, phosphorous, and sulfur in addition to hydrogen and oxygen - all need to be present. And there must be a source of energy. 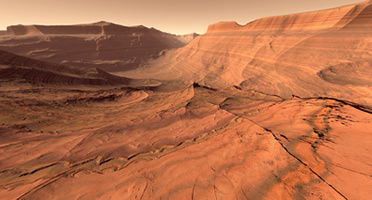 So, might humans explore a place on Mars where the rocks record that environment from long ago? There appears to be a variety of sites that satisfy the criteria for a past habitable environment. The Mars Reconnaissance Orbiter is a key component in finding them because of its powerful instruments including HiRISE (a high resolution camera) and CRISM. A human mission to Mars would probably use an orbiting spacecraft for the round trip from Earth to Mars orbit and back, and a separate landing and ascent vehicle that would take astronauts from Mars orbit to the Martian surface and back to orbit. Each leg of the round-trip voyage to Mars would take about 7 months. The "consumables" the astronauts would need - food, water, and oxygen - would be far, far more than for a 2-week trip to the Moon and back. One idea is to launch supplies separately to Mars ahead of the astronauts so they could restock once at Mars. 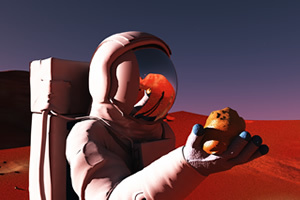 Alternatively, water and oxygen could be recycled; some food could even be grown onboard the spacecraft. In any case, the spacecraft would be very, very large - probably too large to be launched from Earth, and requiring assembly in Earth orbit much like the international space station. How long would astronauts stay on the Martian surface? Mars and Earth have the correct alignment for a launch from Earth to Mars about every 25 months. Once reaching Mars, the astronauts would have to wait for the next favorable alignment for Earth return. They could either stay for about one month and then return to Earth, or stay about 17 months and then return to Earth. What would living conditions be like on Mars? Mars' surface has no liquid water. There is very little ozone in the atmosphere to block ultraviolet light. Atmospheric pressure is so low that without the protection of a space suit an astronaut' s blood would boil. On top of all of that - the weather is terrible! The average temperature is around -68 degrees Celsius (-90 degrees Fahrenheit). Because Mars' thin atmosphere retains little heat at night, the difference in temperature over one Mars day is mind-boggling. In the warm part of summer, the daytime high temperature can reach 37 degrees Celsius (99 degrees Fahrenheit), then drop to a low before dawn near -93 degrees Celsius (-135 degrees Fahrenheit). An astronaut must always be in a pressurized vehicle, dwelling, or spacesuit; stepping out of it would be as sure a death as stepping into the vacuum of deep space. Why have we not sent humans before? There are a number of reasons but the main reasons are the money and the technology. Sending a rover to Mars costs over one billion dollars… sending humans would cost hundreds of billions. The list of technical issues that need to be solved before sending humans to Mars is equally staggering. Optimistically, it will probably be no less that 20 years before humans could safely depart for a round trip to Mars.